The South West African country of Namibia is said to have of the most stunning landscapes on the continent, a place where the dunes of the world's oldest desert meet the thundering waves of the Atlantic. And at its centre is the capital city of Windhoek. Whether it be by accident or by legendry Germanic planning, the capital is not only a central hub but it is also the physical epicenter of this massive country. 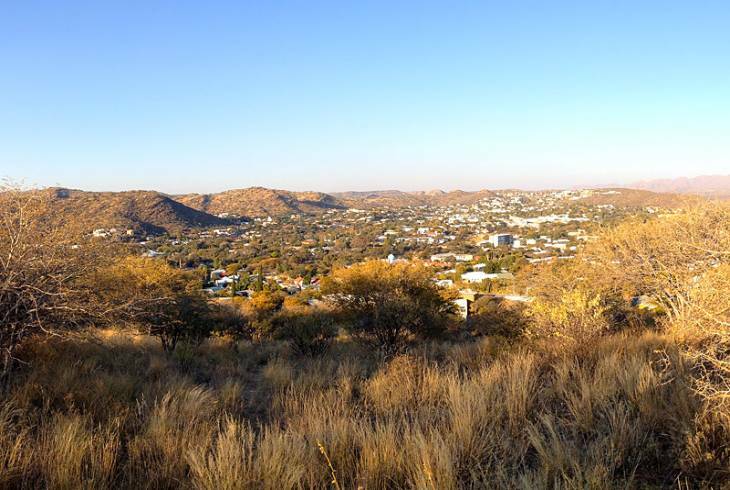 Set 650 kilometers north of the Orange River, 360 kilometers from the Atlantic Ocean and 1680 meters above sea level, Windhoek lies in a basin between the Khomas Highland, Auas and Eros Mountains. The town was originally developed at the site of a permanent spring but its development boomed after Jonker Afrikaner, a Nama leader settled there in 1840 and built a stone church for his community. The country saw multiple wars which led to the neglect and destruction of the settlement. The extent of the damage was so great that the city of Windhoek was founded a second time in 1890 by Major Curt von François of the Imperial German army. Most of the tourists who visit this beautiful country on a fly drive safari, enter it by flying into Windhoek and use the city as a springboard to explore its many attractions. The city itself is filled with German styled buildings, which serve as a reminder of Namibia's early colonial history. Some of the cities older buildings including the Alte Feste (old fort), Christuskirche and Tintenpalast (the parliament buildings) are of particular interest. The Alte Feste Fort, was once the stronghold of German colonialism but in a unique twist the building now houses the National Museum. Unique because the museum places particular emphasis on the freedom struggle and Namibian independence. Some other notable structures include the iconic Reiterdenkmal (equestrian memorial), St Mary's Cathedral and the Turnhalle Building. During daylight hours the streets bustle with a European cafe vibe, where the main cuisine is German, but Namibia's love of meat can be seen in the quantity and quality of meat on offer. The streets however are filled with people of all ages and cultures, all displaying a wonderful sense of pride, hope and aspiration. And when the sun sets the city offers a wonderful selection of restaurants, bars and night clubs. During the period of South Africa's occupation of the city, it was divided into three areas, two of these were outlying suburbs. Khomasdal was set aside for the so called coloureds and Katutura for the blacks. Today these both have a vibrant nightlife and over the weekends the atmosphere is electric. They are still disadvantaged areas that can be extremely daunting and even unsafe, but with a little local guidance visitors could be in for the time of their lives. Some of the attractions in and around Windhoek that should be on every visitor's itinerary include the previously mentioned Alte Feste (Old Fortress) which was built in 1890 and today houses the National Museum. There is also the Lutheran church, Christuskirche, which was first opened in 1910 and is situated in the historic center of Windhoek next to Parliament Gardens and Tintenpalast. Heroes' Acre, the National Library of Namibia, Reiterdenkmal (Equestrian Monument) are also worth a visit. The Supreme Court of Namibia is Windhoek's only building that has been erected since independence in an African style of architecture. Heinitzburg, Sanderburg, and Schwerinsburg are the three castles of Windhoek which were built by architect Wilhelm Sander. Tintenpalast or the Ink Palace lies within the Parliament Gardens has the seat of both chambers of the Parliament of Namibia. Turnhalle is a neo classicist building of Wilhelmine architecture and was inaugurated in 1909. Finally Zoo Park is a public park on Independence Avenue in downtown Windhoek that is beautifully landscaped with a pond, playground and open-air theatre. For those flying into or out of Namibia ity is important to know that then city of Windhoek is served by two airports. Although the closest airport is Eros, only 7 kilometers south of the city center, it caters mainly for smaller craft. Hosea Kutako International Airport is slightly further away at 42 kilometers east of the city but is served by a number of foreign airlines. There are also a number of air charters, as well as helicopter and fixed-wing aircraft rentals available. Windhoek overview. Windhoek Accommodation and Information.